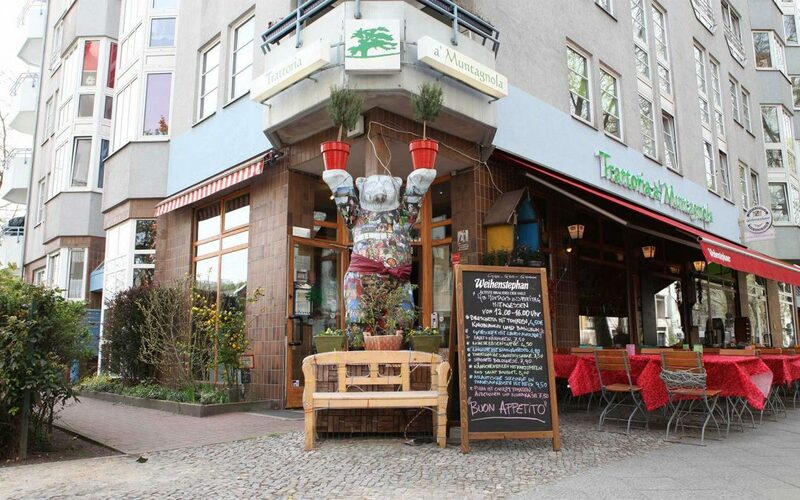 This is one of the historic Italian restaurants in Berlin, offering a menu for all tastes with best quality products. There are people and places in the world that are destined to conquer your heart; regardless of their nationality, these people will conquer you with their values. Pino Bianco and his Muntagnola belong to this kind of people and places.Muntagnola is the name given to the restaurant but originally it was the nickname given to Pino’s mother. Ravioli seasoned with cinnamon and ricotta, Strozzapreti (an elongated form of Cavatelli, or hand-rolled pasta typical of the Emilia-Romagna, Tuscany, Marche and Umbria regions of Italy) with butter and sage, gnocchi with ricotta, fusilli with mollica (soft inside of bread), tomato and sultana grapes, agnello alla Contadina (cooked lamb seasoned with oil, potatoes and onions), castrato alla pastorale (adult lamb stew seasoned with onions, garlic, peppers and celery), fillet of beef, beer braised rabbit, bruschetta seasoned with fish eggs, fresh mussels, homemade bread, buffalo mozzarella, grilled Scampi and much more; the menu is so wide and varied that Pino and his mother have already published two cookbooks in Germany in order to never lose these recipes.